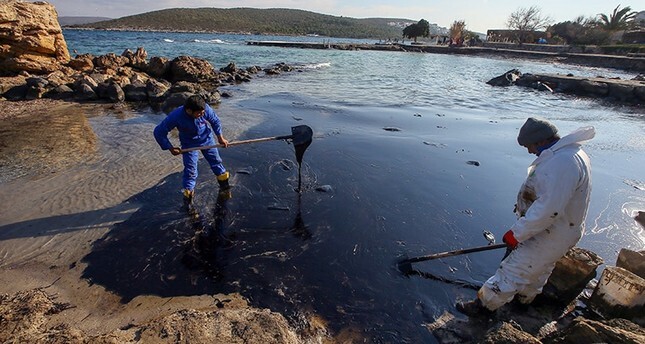 The Ministry of Transport, Maritime Affairs and Communication has raised the fines for pollution caused by vessels by 41 percent, and has implemented stricter regulations after a ship hit rocks and spilled 50 tons of fuel in western Turkey. The ministry's decision follows the incident involving Lady Tuna, a ship which hit rocks on December 18, 2016 and was responsible for spilling 50 tons of fuel near the Fener island of Turkey's western Izmir province and has been fined 5 million Turkish liras ($1.37 million). The nearby beaches of Paşa Limanı and Ilıca Yıldız Burnu had been polluted by the accident and the cleaning the coast had taken days. The new regulations increase the fines by 41 percent. The fines determined by the weight of the ship before ranged between 5,000 Turkish liras ($1,372) and 120,000 Turkish liras ($32,924). According to Habertürk daily, locals protested after the Lady Tuna incident because they thought the representatives of the tourism sector and environmentalists were too late to step in. Complaints had also been expressed due to claims from locals that the ship, running under a Panamanian flag, had not hired a harbor pilot. According to the new ministry code, obligation to hire harbor pilots when approaching harbor facilities has been extended to include fisherboats, while previously only comprising foreign ships. Abandoned or impounded ships, which pose a risk to life, property or the environment will be monitored and assessed, and removed if necessary. Individuals who are in charge of ships causing any kind of pollution or danger to their surroundings can be levied by the harbor master with an administrative fine of up to 5 million Turkish liras ($1.37 million). All expenditures caused by actions to prevent danger, including the removal of risky ships, will be the sole responsibility of ship owners. The Chairperson of the Izmir Branch of the Turkish Chamber of Shipping (DTO), Yusuf Öztürk, told Habertürk that he is very happy about the new regulations, judging that the risk of environmental pollution has now been reduced to a minimum.